The Shard is the tallest building in Western Europe and on a clear day you can see panoramic views of up to 40 miles of the city from the public viewing gallery. The vision was for it to become ‘a vertical city’ and so it’s home to offices, hotels, residents and restaurants, as well as of course, the awesome The View from The Shard experience. 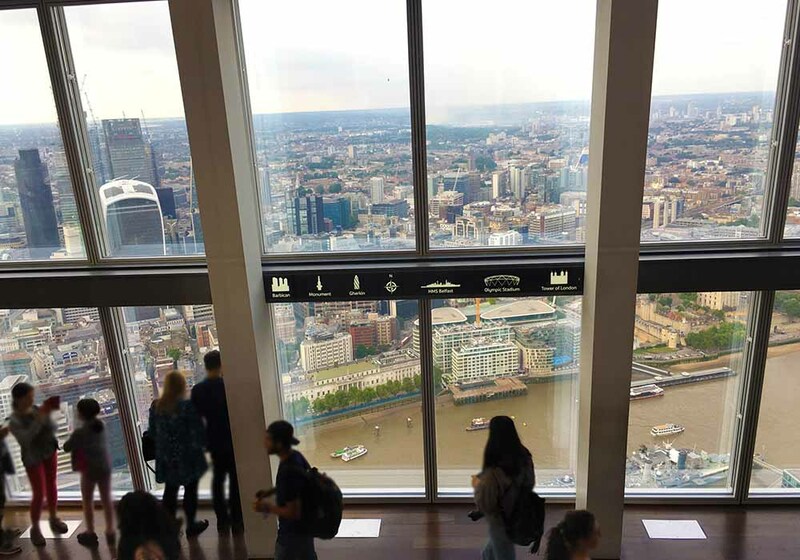 The View from The Shard’s viewing gallery experience certainly makes for a special family day out and is something that everyone should do at least once. Situated in the heart of one of the most vibrant parts of London, it’s easy to make a day of it and make the most of what the city has to offer. First things first and it probably goes without saying, but if you’re scared of heights – this is not one for you I’m afraid! The View from The Shard experience takes you all the way up to levels 69 and 72 of the 244 metre-tall building, which is predominantly made of glass, so that you get a panoramic view of London. The open-air Skydeck on Level 72 is the highest-accessible level and exposes you to the elements and the sounds of the city 244 metres below. For this reason you might want to monitor the weather forecast and wrap up depending on the time of year. 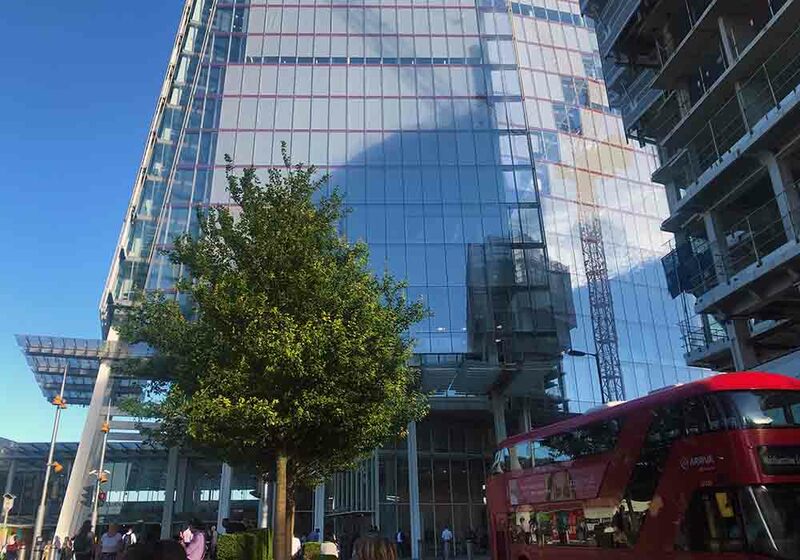 However, although you are al fresco, it’s worth noting that you’re still protected and secure behind The Shard’s glass walls! Top Tip: Download the Activity Sheet before you go so that you can play ‘Spot the Sights’ with the kids and challenge them to find some of London’s famous sights like the Tower of London and St Paul’s Cathedral. Visitors arrive through a dedicated entrance where you will have to go through a routine but fairly rigorous security procedure that requires you to go through a scanner and place your bags through an x-ray, not dissimilar to the procedure at airports. It’s worth noting that you are not able to take pushchairs up to the top but you can leave these for free in the designated area in the booking hall. There is no official cloakroom facility though for bags or coats etc. 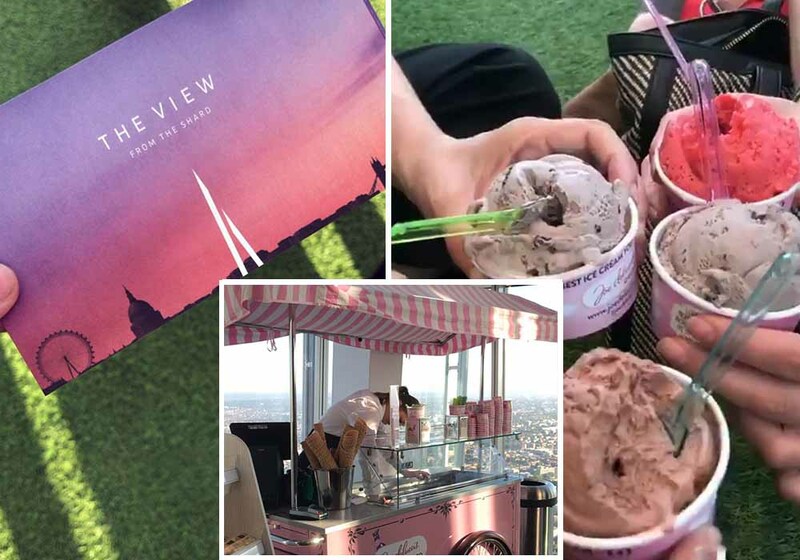 Unfortunately you’re not allowed to take your own food or drink into the experience, however both the indoor viewing gallery and open-air Skydeck have a licenced bar, where you can buy drinks and snacks. They also have seasonal additions too such as an ice cream and sweet stand in the summer months, which is perfect for kids. Note that you can even pre-book your drinks if you wish to. After the security check, you can have your photo taken in front of a green screen which you then have the opportunity to purchase at the end of the experience in the Gift Shop. After you pass through security, you have to take a high-speed lift, in two-stages. (Word of warning: this will make your ears pop as it travels at 6 metres per second making the journey from level 1 to level 68 last about a minute.) After the first lift, you will step out onto a giant cryptic floor illustration which maps out the different suburbs of London. It’s fun and surprisingly challenging working out which is which! Thankfully the queues for the lift are not usually too bad as staff are diligent in marshalling people through. 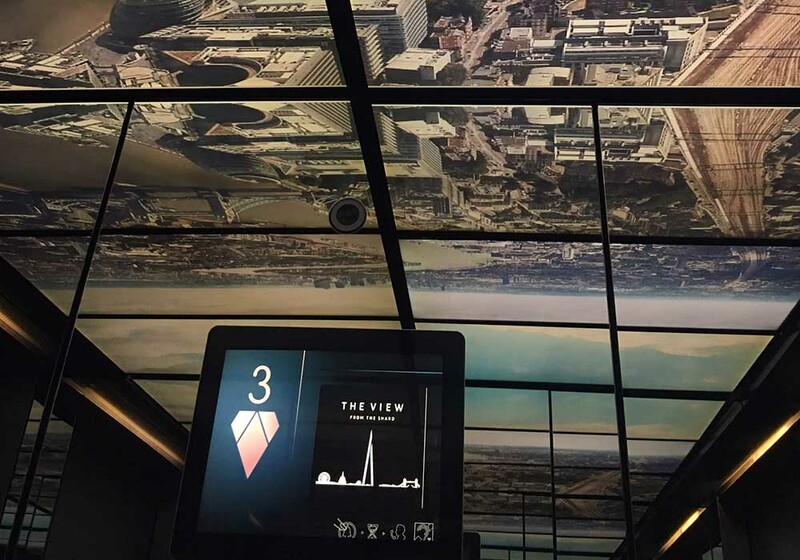 The lifts themselves feature a digital ceiling which mimics the seasonal weather. It’s then a short staircase up to Level 69, where you’ll be greeted by the spectacular panoramic view of London. On a clear day you can see for up to 40 miles across the city. The View from The Shard do have a London Landmark’s Guarantee which specifies that if on your visit you are unable to see at least three of the following landmarks – The London Eye, St Paul’s Cathedral, The Gherkin, Tower Bridge and One Canada Square – they will let you return within 3 months for free. Do check out the website as well for their Live Views Gallery. 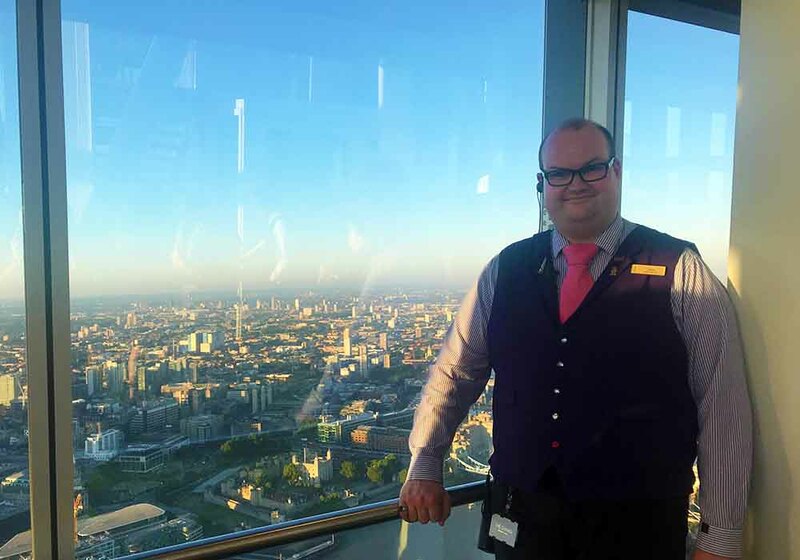 Keep an eye out for the gold-badged Guest Ambassadors (like this awesome chap, SImon) who are very friendly and happy to answer any questions you have about the building and sights around. They’re also very handy for if you need any help with that activity sheet we mentioned earlier! They can even tailor a mini guided tour for you based on your own interests. They are a fountain of knowledge and have got plenty of facts to share. Top Tip: Once the kids have completed the activity sheet, don’t forget to hand it back in to the ticket desk at the bottom on your way out, so that you can be entered into the monthly prize draw. Allow about 45 minutes to an hour to take in the full experience. There are plenty of selfie opportunities and places to sit – perhaps one of the most unique being the Loo With A View! On the 68th floor you can find the toilets which are in themselves an extraordinary experience because they feature a floor-to-ceiling panoramic window which allows you to gaze out across the city, all whilst sat on the throne! The View from The Shard is open from 10am-10pm Monday – Sunday (summer hours). Although they do often run special events etc, so it’s worth checking the website prior to your visit. Visits in the late afternoon are particularly spectacular, as the sun starts to set. However of course, this is a popular visiting time, so be prepared for more people. Definitely make use of London’s sunset calendar if you’re planning a dusk trip. Standard tickets are £30.95 on the day for an Adult and £24.95 for a Child ticket. If you book in advance you can benefit from a cheaper rate (£21.50 for Adults, £17.95 for kids). LittleBird are a proud partner of The View from The Shard, so it’s also worth checking out our website to see if we have any family offers or experiences available. We currently have an awesome exclusive VIP breakfast experience for families which is taking place on Saturday 18th August at 9am, granting you access to the viewing gallery an hour before everyone else for a unique breakfast with face painting, competitions, goodie bags and more. See here for more details. 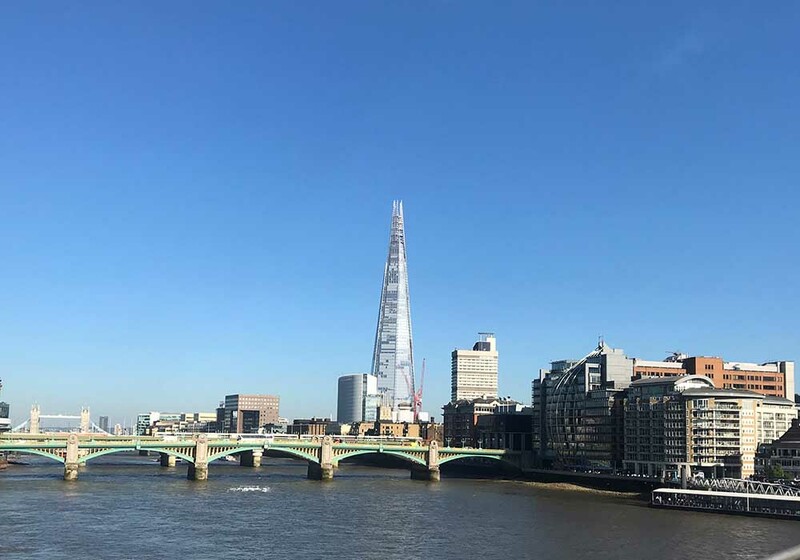 The Shard is located moments from London Bridge station and the main entrance and ticket office to the attraction is on Joiner Street, just a few minutes’ walk from London Bridge Underground Station (Northern and Jubilee lines) and London Bridge Station (Southern and South Eastern trains). When exiting the underground station, follow the signs for The Shard or Joiner Street. If you are exiting from London Bridge Station, turn left and go down the escalator, this will take you to Joiner Street where their entrance is located. If you prefer the bus, there is a bus station outside the main entrance to London Bridge Station which serve buses 43, 48, 141, 149 and 521. Please note there are no parking or drop-off facilities at The View from The Shard. There are however, a number of privately owned car parks in the local area, the nearest being approximately a five minutes’ walk away. Details can be found at Parkopedia. Hi no I didn’t get a reply. I will call them to check.